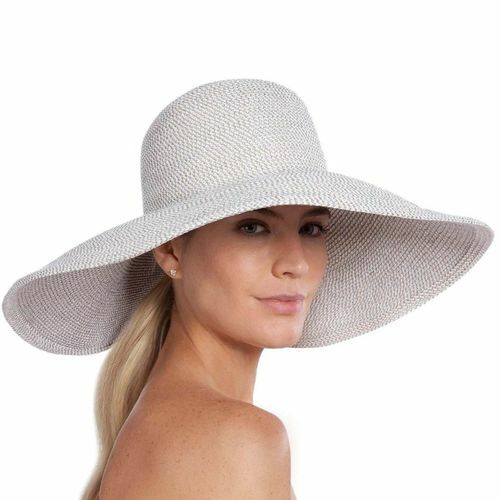 Large Floppy Sun Hat of Squishee® works for the beach as well as for town. Dramatic 6.5" brim span provides maximum protection for face, ears, neck and shoulders. Signature rivet logo is discreetly placed at the back of the crown. Elasticized inner band fits most. Blocks 95% UVA/UVB rays. Independent testing in accordance with AATCC (American Association of Textile Chemists and Colorists) test methods have determined this product's effectiveness for blocking ultraviolet radiation as well as UVA/UVB radiation. This product was awarded the highest rating of 50+ UPF by independent testing. To learn more about AATCC testing, go to www.aatcc.org. Brim Span 6.50"